The Second Judicial District Commission on Judicial Performance, on a vote of 10-0, recommends that Judge James B. Breese BE RETAINED. Judge Breese was appointed to the Denver County Court bench in February 1987. Prior to his appointment, Judge Breese was in private practice in Denver and served as a Clinical Professor of Law at both the University of Denver and the University of Colorado law schools. 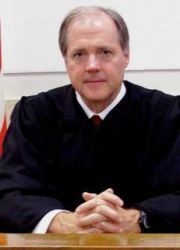 Judge Breese received his undergraduate degree from Harvard University in 1969 and his law degree from Northeastern University in 1973. In addition to a variety of efforts to make improvements in how the court works, Judge Breese engages in community activities aimed at improving the legal system and reaching tomorrow’s lawyers. He served a term on the Board of Trustees for the Denver Bar Association, taught classes for the Student Law Office at the University of Denver Sturm College of Law, served as a leader in the Marsh Inn of Court, and remained active in the Denver Bench Bar Committee sponsored by the Denver Bar Association. He remains active in his neighborhood association as well. During the current term, Judge Breese presided briefly in traffic court and has primarily presided over criminal matters. To assess his performance, the Commission reviewed survey results of attorneys and non-attorneys who have appeared in Judge Breese’s courtroom, conducted a personal interview with the judge, and reviewed three of his written opinions and his self-evaluation. Selected members of the Commission observed Judge Breese in court. Analysis of all these data support retention. In the surveys of attorney and non-attorneys, Judge Breese received an overall combined average rating that exceeded the average combined rating of all county court judges standing for retention, although it must be noted that the sample size, particularly for non-attorneys, was relatively small. Judge Breese received higher than average marks on case management, knowledge and application of the law, communication, demeanor, and diligence. Of the attorney’s surveyed, 73% recommended retention, none recommended against retention, and 27% expressed no opinion on retention. Of the non-attorneys surveyed, 100% recommended retention. The written comments offer further support for the recommendation to retain Judge Breese. Reported strengths far outweighed and outnumbered weaknesses. Attorneys described him as respectful, even-tempered, thoughtful, patient, caring and “exemplifying the way judges should carry themselves on the bench.” Non-attorneys agreed and described Judge Breese as fair, level-headed, and professional. Commissioner observations of Judge Breese’s courtroom confirmed the survey responses. The reviews of his written work demonstrate a thoughtful judge who knows the law and writes well.